The heat haze is intense. Not only is the sun burning in the sky, but an incessant desert wind is blowing straight out of the Gobi. And, if the sun and wind weren’t already enough, the radiator in our aged minibus is packing up. The only way to avoid the engine overheating is to have the fans on at full blast. Even then, every few miles we have to turn the van into the wind and open all of the doors in an attempt to reduce the engine temperature from incandescent to merely roasting. There isn’t a sign of another human. Every five minutes or so we pull up next to a barrel on top of a pole and I look inside. Between the heat, the emptiness, and the repetitive task, I feel like I’ve entered another world. That day was a couple of years ago now, and I was looking for Saker Falcons (Falco cherrug). The Saker has a huge range, covering some very remote parts of the world. Living in areas with few direct anthropogenic impacts, the Saker seems an unlikely candidate for extinction. Yet its population is plummeting, perhaps by 50% over the last 25 years. Assessed as ‘Least Concern’ by the IUCN in 2000, the status slumped in ‘Endangered’ in only a few years. The Saker is a bird of the open steppe, specialising in hunting small mammals and birds. Having seen a Saker stoop on a thrush, I can testify to their speed and power. These attributes also make them excellent for falconry, and for centuries Sakers have been used in the Middle East to hunt Houbara Bustard. Each year birds on migration would be caught on their passage through the Arabian Peninsula. Unfortunately, a Saker is worth a lot of money. And in recent decades, thousands of birds have been illegally captured in their breeding grounds and smuggled into the Middle East. This unregulated trade is one of the key causes for the decline in Saker populations. Although Sakers are CITES listed, the very fact they live in such remote areas makes it difficult to prevent illegal capture. So can smuggling be discouraged? The answer is to flood the market with legally obtained birds. Yet the global Saker population could probably not support such an offtake. 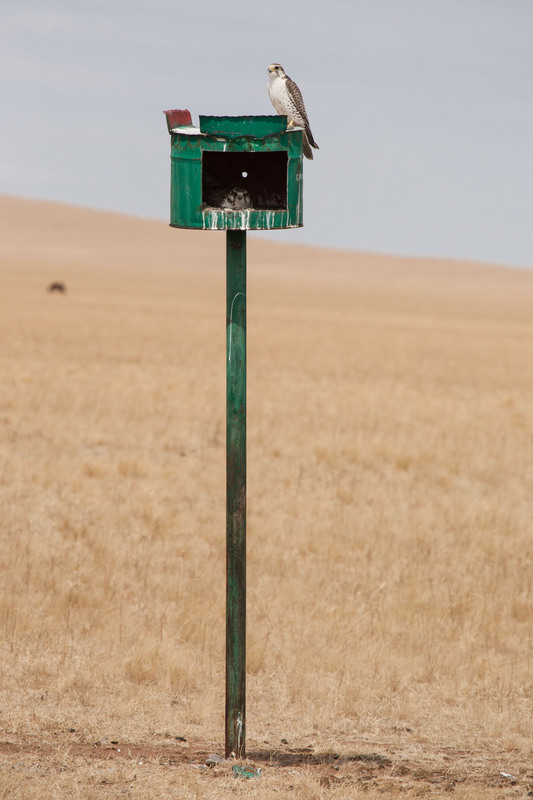 This is where the Middle East Falcon Research Group (MEFRG) came in, with a plan to raise the Saker breeding population by installing artificial nests in areas with high prey densities but low nest site availability. 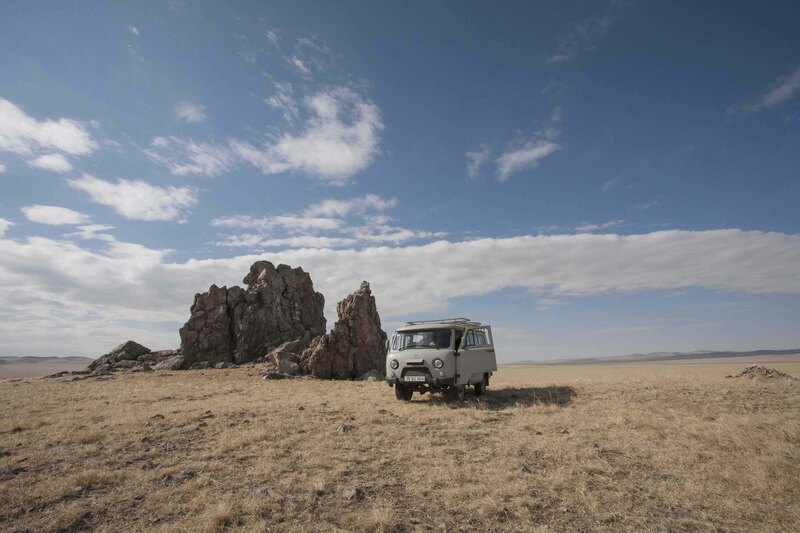 In Mongolia the steppe teems with passerine birds and small mammals, but nesting sites are limited to occasional rocky outcrops, and it represented an ideal country to host the project. 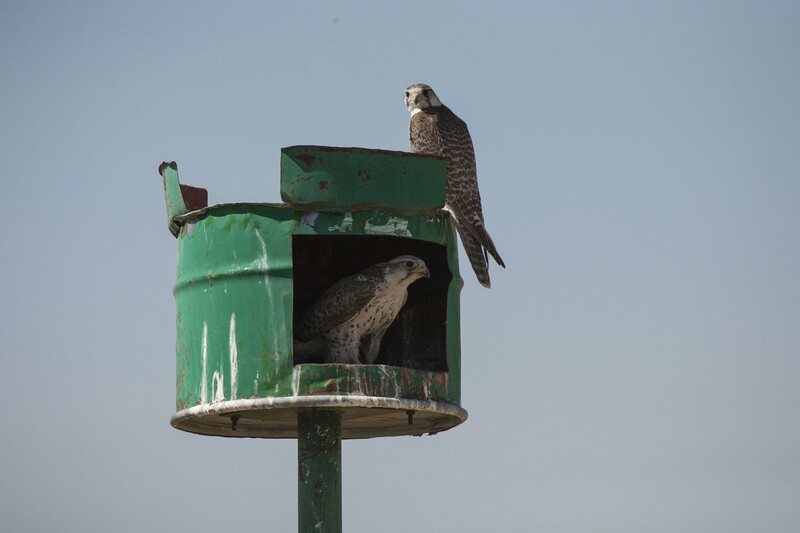 Funding came from the Abu Dubai Environment Agency, where many wild Sakers are used for falconry. If a sufficient increase in the breeding population could be achieved, the Mongolian government would be allowed to legally export Sakers to the Middle East. Five thousand nests were constructed from old orange juice barrels welded to the top of poles, and they were installed in suitable habitat 1km apart. 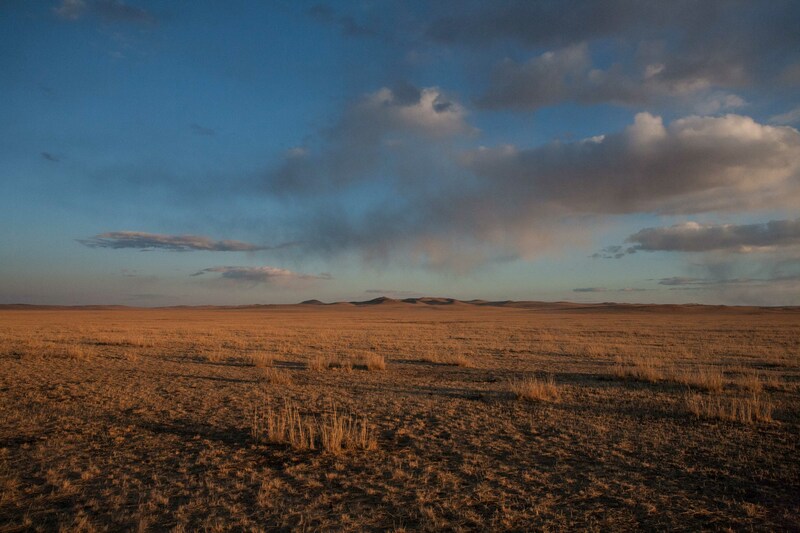 Whilst 5000 seems like a lot, they are lost in the enormity of Mongolia. By the time I was in Mongolia, it was the third breeding season. The project seemed to be a huge success; we recorded over 600 breeding pairs that year. 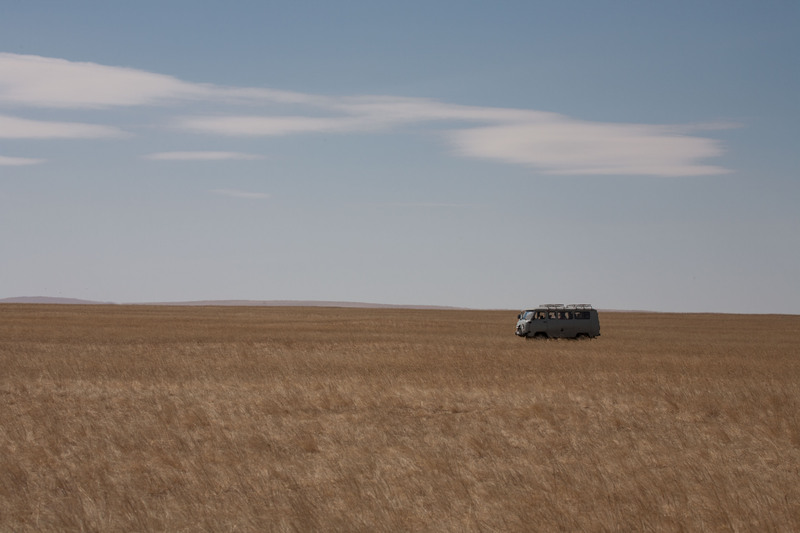 Those surreal moments in the field made my time in Mongolia some of the most interesting work I’ve been involved with. Yet assisting on the project also made me realise that whilst solving conservation problems is not straightforward, it is possible to find common ground. Although the size and international scale of the smuggling seems insurmountable, cross-border cooperation was also the key to this innovative solution. All of the stakeholders involved, whether conservationists or falconry enthusiasts, had a common goal; ensuring that the Saker can recover and thrive. ← The Conservation Conversation: Is climate change the greatest threat to biodiversity? Great to hear about such success! Before my PhD I was involved with a project that was aiming to study the population genetics of the Saker falcon, so this is especially interesting.